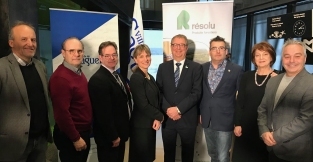 March 22, 2019 - The residents of Saguenay (Quebec) will gain access to an area of stunning natural beauty when the site of Resolute's former Port-Alfred mill is sold to the City of Saguenay for the symbolic amount of $1. The area, which measures approximately 0.3 square kilometers (0.1 square miles), features a dramatic landscape dominated by the awe-inspiring Saguenay Fjord (a narrow inlet bound by steep cliffs). The sale will be concluded later in 2019 and is contingent upon a promise from the City that the site will remain accessible to the public. “We are pleased the Port-Alfred site will be transformed into a public space for residents of La Baie and the Saguenay region to enjoy year round,” said Yves Laflamme, president and chief executive officer. Josée Néron, mayor of Saguenay, added, “Our vision is clear: We want to develop a space for recreational use accessible to all citizens, while respecting our budgets and in collaboration with the community."